File upload is one of the most popular features in modern web. And we have quite a few libraries that can help us to build upload form. 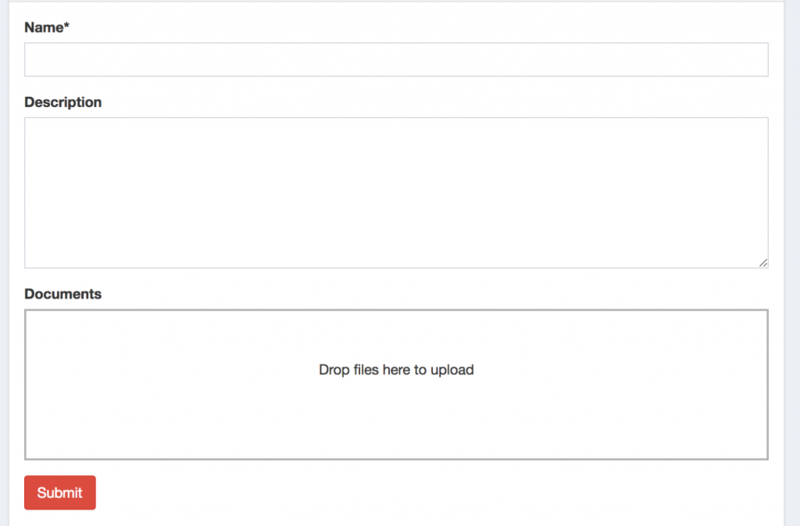 Let’s take two of my favorites – Dropzone on the front-end, and Spatie MediaLibrary on the back-end, and build a great uploading experience, in this tutorial. First, what we’re building here. 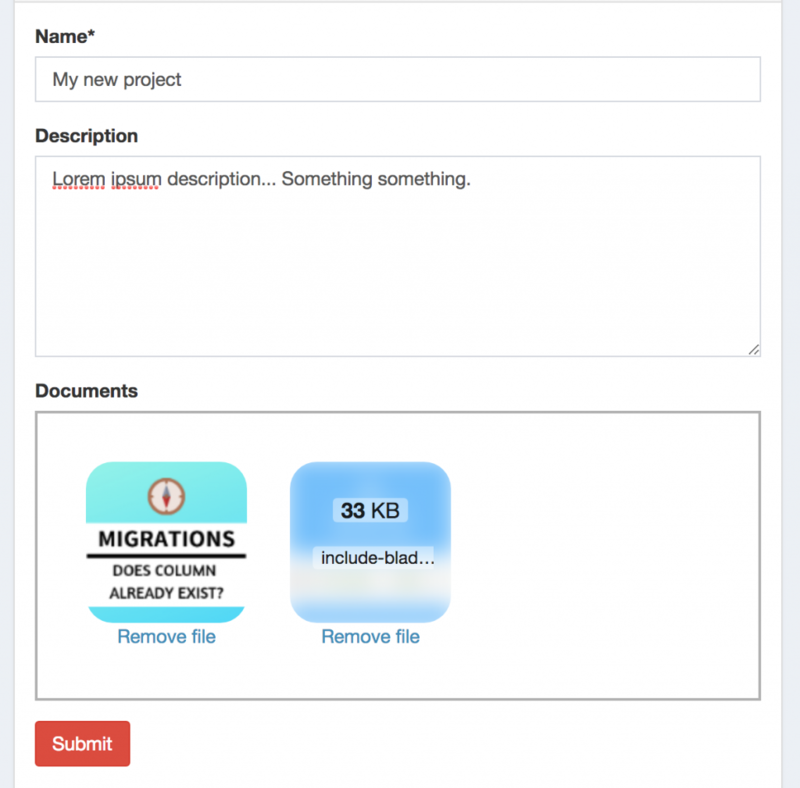 A simple for to add Projects, where you can also upload multiple files for every project. As you can see, file upload has a big block instead of just an input file field. That’s how Dropzone works. But let’s take it one step at a time. php artisan vendor:publish --provider="Spatie\MediaLibrary\MediaLibraryServiceProvider" --tag="migrations"
By this time, we should have media table in our database. This table uses Polymorphic Relations, so in our case will store records with model_type field equals app\Project, which means that media file will be assigned to a project (not to a user, or anything else). Ok, so what you can see here? Dropzone block is just a DIV with ID and some classes, how will it actually work? A few more details like CSRF-token or 2 MB upload restriction, but I think you will figure it out. So, as you can see, we’re loading jQuery, Bootstrap theme and Dropzone CSS+JS from CDN. Ok, at this point, we should be able to drop the files into our Dropzone block, but they are not being uploaded yet. We need to implement that route(‘projects.storeMedia’) part. Nothing magical here, just using standard Laravel/PHP functions to upload file, forming its unique filename, and returning it along with original name, as JSON result, so that Dropzone script could continue its work. Notice: I store files temporarily in storage/tmp/uploads, you may choose other location. Now, let’s hit Submit and see how to tie it all together. Looks simple, doesn’t it? Typical creating of Project record, and then going through each hidden document field (remember, we create them after each file upload), and adding them into Media Library. At this point, you should have records in media database table, related to the Project’s ID that you have just saved. In other words, first we delete unused files, and then assign only those that are not in the media list yet. I didn’t put it in this article, but you may want to handle the situation when people upload the files on the form but then don’t hit final Submit. It means that the files are still stored on the server. It’s up to you how to deal with them – save in user’s “memory” somewhere for future use, or maybe create a separate cron-based Artisan command to cleanup all those files that have not been used. That’s it! For more information, visit official documentations of both packages and Laravel Filesystem. this tutorial is really awesome and straightforward! Thanks for sharing this tutorial and keep up the good work! Have implemented your approach! Thank you. This was really hard to find a solution online, despite close to a million downloads of Media Library. The MediaLibrary creates folders with the uploads, e.g. media_id = 1 has a folder with it’s files, conversions, etc.. However, this approach puts all images in a single folder. Do you have a solution to maintain that functionality? Great that my article helped. What exactly do you mean about all images in a single folder? So how exactly you want to save them, in what folder structure? Here’s a video at 15:31 shows how the records are stored by default. It seems like a clean way to keep order with media items. What are your thoughts on having folders per record or not? I don’t have any issues with images storing in their own subfolders. At first it seemed unnecessary, but then it doesn’t cause any problems, and sometimes help with search. So your demo created folders? I’ll take a look again, for some reason the installation I have just dumps all files into storage/tmp/uploads per the tutorial. Can you think of anything I missed? I’ll remove the count block (your below comment). A few posts on stack talked about php7.2 not being able to handle the count. Well spotted, in that particular tutorial indeed I see I missed the part of moving files to their folder appropriately. Will check both of those – this miss, and the previous one with count() and will update the article. But only on Monday, sorry. Hi again Trevor, I double-checked the code again and seems that it’s all working, maybe you missed something. 1. Storing from tmp folder to “normal” storage is done by ->addMedia() function. 2. That count($project->document) comes from JS init method, and it does set project document variable. So, works for me, but maybe I missed some edge case while testing. Have you received that error on the update method? Probably error comes from count($project->document) and I see that in the article I forgot to include that relationship from the model. Well, just remove all that block of code (it is for deleting old documents) and it will start working. I don’t have the code of that demo project anymore, so I can’t reproduce that relationship, sorry. Ok, finally tracked down why the folders were not being created. As a beginner, I watched videos and saw folders being created to my amazed eyes – but my demo here did not create them. It was just maddening because without the disks second parameter, obviously now, they were not created. is Step 3 really necessary? I mean the part with uploading the file. Can’t it be handled by medialibrary package only? In the way I do it, it is necessary. Cause I’m uploading the files on the event when they are actually uploaded with Dropzone, so that’s done in Step 3. Later Step 4 is only ASSIGNING files by their IDs (files already exist on the server by then) with Media Library. But maybe you can come up with a way to make it all in one step, then let me know I will update the article. Eloquent Relations: how to order topics by newest posts?